This is the popular Star Wars The Force Awakens Chewbacca Talking Mask, made famous by the Chewbacca Mom (and Chewbacca, of course!). Condition is New. HAN SOLO & CHEWBACCA ORAL-B TOOTHBRUSH 1983 STAR WARS. Condition is New. Shipped with USPS First Class Package. Star Wars Chewbacca Talking Mask The Force Awakens Wookie. Used. See pics Condition is Used. Shipped with USPS Priority Mail. No insert but POP is intact. You’ll receive the exact item pictured. Vintage Star Wars Pillowcase Luke Leia Darth Vader Chewbacca U.S.A.
Cube of notepad sheets are sealed and unused. Measures 2.25” tall x 2.75” wide x 2.75”. 2019 Star Wars Celebration Chicago Chewbacca Pin Lanyard Set Store Exclusive! 2019 Star Wars Celebration Chicago Chewbacca Pin Lanyard Set Store Exclusive!. Condition is New. Shipped with USPS First Class Package. Perfect and Totally Gift Worthy. It's nice to know what you are buying and from whom. STAR WARS 30th Anniversary Ralph McQuarrie Concept Chewbacca NIB 2007 Hasbro . Condition is New. Shipped with USPS First Class Package (2 to 3 business days). item is exactly as shown in photos. item is in NM condition. item comes from a clean pet & smoke free home. item is packaged in bubble wrap & shipped safely in a cardboard box with USPS typically within 2-3 business days of received payment. thanks for shopping & make sure to check out all my items listed. new arrivals every week! enjoy! New Star Wars Celebration Chicago 2019 Store Exclusive Chewbacca Pin Lanyard Set. Condition is New. Shipped with USPS First Class Package. Disney Parks Exclusive Star Wars Weekend Chewbacca Stein Cup Mug. Condition is Used. Shipped with USPS Priority Mail. THIS IS A LOT OF 4 DIFFERENT STAR WARS PUNCH SODA CAN. THESE ARE ALL FULL AND IN GREAT SHAPE. 1977 on back of Leg. Does not include stand. Star Wars Chewbacca Single Serve Coffee Maker Black with Mug NEW. Condition is New. Shipped with USPS Priority Mail. Chewbacca Seat Belt Cover Velcro closure for easy installation. Trending at $20.23eBay determines this price through a machine learned model of the product's sale prices within the last 90 days. Condition is Used. I n good shape original owner. 1995 kenner star wars Chewbacca. Star Wars Plush Talking Chewbacca 15" Batteries included. Pre-owned, clean and working! After a series of adventures on Vandor andKessel, Chewbacca embarks on the smuggling trade, serving as Han's co-pilot on theMillennium Falcon for the rest of Han's life. 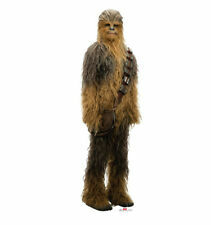 Standing at eight feet tall, Chewbacca is covered with long hair and wears only a bandolier. Item is brand new, never been used, and still in original packaging. Please feel free to ask any questions, and have a wonderful day! Chewbacca Bandolier Leather Bracelet. A ThinkGeek exclusive. Materials: Leather 316L surgical stainless steel. Slide-clasp closure for extra protection. It is made by Comic Images. It is not new. His fur is in great condition! Strap across Chewbacca's body to stabilize his arms. Nylon fabric lined zipper pouch for storage on Chewbacca's back (approx. ). Vintage Original 1977 Chewbacca Star Wars! 100% Complete! Mint! Rare Vintage Original 1977 Star Wars Chewbacca! 100% Complete! Condition is Great! We purchased this from the original owner! The joints are very stiff. Minty! Free case included! Shipped with USPS First class mail. If you have any questions please feel free to ask. Check out our other listings. Follow us on EBay,Facebook and Instagram. I have washed the dust off of these so they may have water spots. 2019 Star Wars Celebration Pin Sets - Complete Set Of 3 Packs plus Chewbacca. New, in packaging. This sale includes all of the available 3 packs from Celebration, including the Chewbacca and Lanyard set. 16 pins in all! Note: I only use Paypal for payment. I only ship within the US. I ask that the buyer pays within 24 hours of the end of the sale. I usually ship within 48 hours of the end of the sale. Thanks again for taking a look, and Happy Bidding! This is the actual item you are getting. Item Condition. So don't be left out of the action for not capturing this wild & wooly Pilot, Space Smuggler and Resistance Fighter for your Star Wars Collection! Direct from the manufacturer's Smugglers Cove warehouse, without price stickers or shelf wear. Super Rare and Unique, Brand New, Unused, Sealed in Package Star Wars Chewbacca Popcorn Head! Received this on the Opening Night of ‘Solo’ , Only one on eBay! Get these hot collectibles for your Star Wars Collection Now before they’re gone forever! Check all pictures before buying, No Returns, Thank you for looking! Let me know if you have any questions, please! Ships Fast, 100% Feedback, 100% Satisfaction! Launch into exciting Star Wars adventures with the Nerf Super Soaker Chewbacca Bowcaster! With this water-blasting Bowcaster, kids can imagine helping the Wookiee hero Chewbacca battle the evil First Order! Car Seat Belt Cover Star Wars Chewbacca Universal Fit Soft Shoulder Harness Pad. Condition is New. Shipped with USPS First Class Package. Dennys Chewbacca Range Trooper Cup Figural Solo Star Wars Story Cup set of 2. Condition is New. Shipped with USPS Priority Mail. This soft and cuddly Chewbacca stuffed animal is an original, Star Wars figure from 1977. Chewy is in remarkable condition for his age. The hair is fine and un-blemished. He is missing 2 of his packs on his strap. The strap is also fastened in 3 places on his back from a tagging gun and can be easily cut with scissors. This original Kenner product brings to life this tempermental, yet comical Wookie character. Thanks for looking! Star Wars Celebration Chicago 2019 Exclusive Chewbacca Pin Lanyard Set Store. Condition is New. Shipped with Flat Rate Freight. 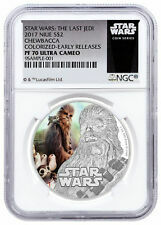 STAR WARS CELEBRATION 2019 CHICAGO CHEWBACCA PIN. Condition is New. Shipped with USPS First Class Package. IRON STUDIOS STAR WARS HAN SOLO AND CHEWBACCA 1/10 SCALE STATUE! 2017 BRAZIL COMIC CON EXCLUSIVE! DELUXE ART! This is an NEW item in great condition from IRON STUDIOS - STAR WARS HAN SOLO AND CHEWBACCA 1/10 SCALE STATUE! Part of our own collection.